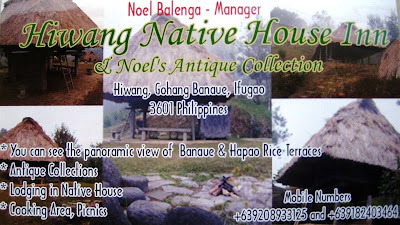 Hiwang Native House Inn is just 9 kilometers from Banaue on the road to Hapao. 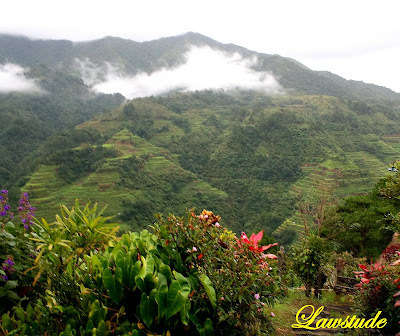 It is an ancestral property managed by Noel, a soft-spoken and very accomodating Ifugao. 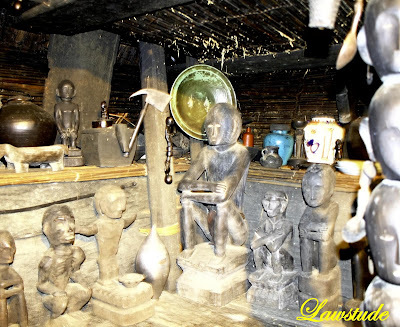 The place also offers antiques specially the bulol or Rice Gods which have gone thru traditional rituals. And best of all, the place is perched atop a high ridge with amazing views of the terraces below. I have promised Noel to advertise the place, so I posted his card and contact number here. 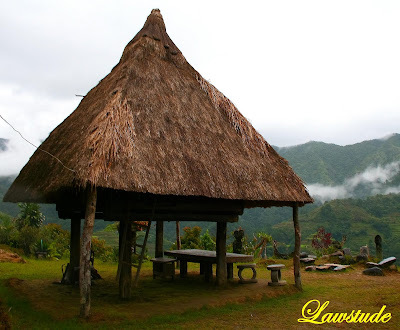 So, if you plan to spend the night in Ifugao and if you really want to feel the nature, go check his place out or contact him at the number above. I've enjoyed looking at your pictures. The scenery is so different from what I see where I live. Such beautiful flowers and mountains! I love that pics... do you live near by? or you went there intentionally? thank you for keep visiting my blog. Please give your permission for me to link your blog..
Just beautiful. I like it! very scenic place, indeed! kasama mo ba loveydove mo dun? ka romantic e! yan ang gusto ko. yung matataas na lugar. astig ng view! naibigay mo na ba ang direction kung paano pumunta dyan? baka lang kasi na miss ko. nice pics. paglaki ko, gagayahin kita! salamat sa pagpasyal sa blog ko at pakikitawa sa katangahan ng inyong lingkod. much obliged. hmmm.. contact noted. nahuli na naman ako dito. ano kayang nangyari at pinagtitripan ng blogspot ang link mo. ayaw mag update. hehe. ang masasabi ko... maganda talaga sa kabundukan. @ dot - thanks for enjoying the view. i must admit that this is one of the most beautiful places i have been too. @ moh bakhriah syah - thanks for loving the pics. i live in the plains and this place is about 7 hours away from where i live. i just went there intentionally. @ phivos nicolaides - thank you. i appreciate it. @ r-yo - panyero di nga eh. i went there alone. nagrent ako pampasahero jeep. 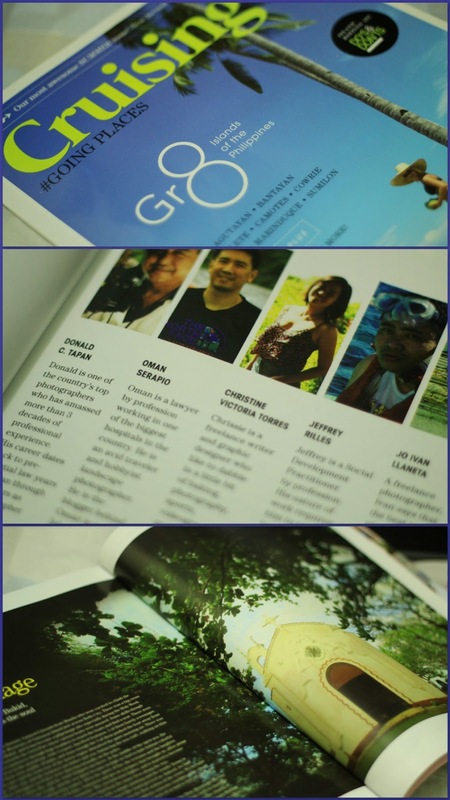 first time ko magtravel ala lonely planet style. @ dakilang islander - initially, it reminded mo of Tam-Awan Village pero mas maganda talaga view dito. @ the dong - di pa yata. pero anjan contact number. cge ituturo ko sayo sa sabado. @ nanaybelen - i couldn't agree more po. @ atticus - hahaha. wala anuman. sige paglaki mo travel ka din. 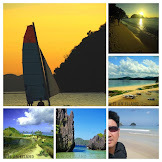 @ the islander - baka nga type ng blog mo yung quezon island kasi ayaw iwan lols. try mo kaya delete tapos add uli. maganda talaga bundok. next post ko dagat uli. so calm and serene.... nice. the top photo is magnificent, the 2nd is breathtaking...great post! Another amazing set of photos. You really make me wanna go and see the rice terraces. Very lovely photo. It must be cold up there. Would love to visit this beautiful place. This is another series of fantastic photos. The landscapes in your country are breathtaking as well as your photos. It is so nice be on top of the world, yeah? Surrounded by clouds and cool mountain breeze. Perfect place to spend some time for reflection or for couples..just a romantic getaway! I'm sure to take note of the Inn. Just in case naligaw ako sa Pinas one of these days. Que lugar lleno de enigmas y magia!! Gracias por visitar mis instantes!! @ kris jasper van dyke - you got the words out of my mouth. 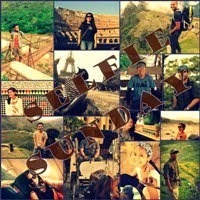 @ luna miranda - i was also torn on which foto should i put first. glad u like both my initial choices. @ vanessa - thatwas actually part of the plan. the place is safe anyways. @ alicesg - its breezy with fogs and a bit of rain showers. perfect for cuddling. @ medam - thank you very much. there are at least 7,000 islands to choose from in my country. @ bw - thank you sir. @ wanderingcommuter - sayang. 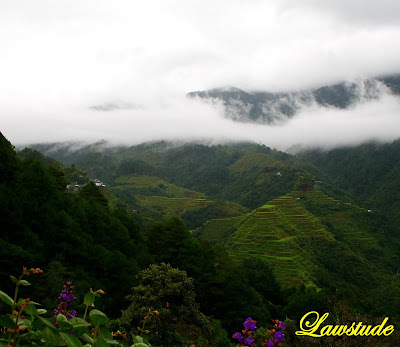 its just about 5 to 6 hours away from baguio. the place is really awesome. @ EM - walang ano man. 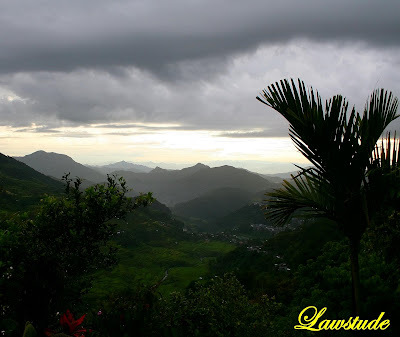 its really a perfect place for couple who want to apend their night and day feeling the nature. Great pictures all of them. Great photos... Wish i could capture shots like these. HAhai... buhay... Kailangan pa magpaka-kuba para mkabili ng magandang CAM. tinry ko nang remove and add. wa epek pa rin. ayaw magmove on. haha. baka nga type yung isla ng gobernador. @ fish whisperer - thank you for liking the photos. cheers. @ andrea - glad you like them. thanks for another visit. @ freddy - thanks. the place is really something. @ maniniyut - kaya mo yan. tyaga lang talaga at kaunting swerte. 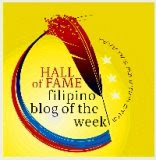 welcome sa blog ko. @ kegler747 - para kasing into the wilds hano. the flora and the mountainscape are just pure bliss. @ the islander - hayaan mo na bai. balik ka na lang every three days lols. @ ash - thank you. the second and the third pic are just an arms length from each other. Very pretty indeed! I'm so jealous. I wish I could go there, too, but since I have motion sickness, it makes it a tad tricky. LS: What a wonderful view you had at this stop. The photos do speak for themselves and are very special. You did a wonderful work on making these great captures. 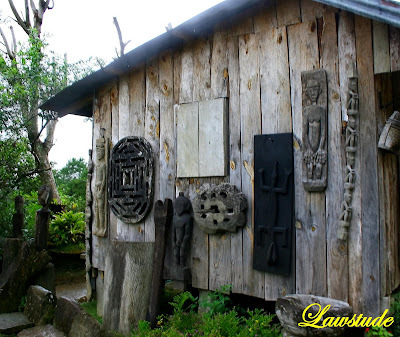 parang dati may nai-feature na community of artists diyan sa ifugao. iniisip ko lang na baka napunta ka dun dahil don sa isa mong kuha dito. fantastic images, very well done, excellent. ganda ng place sobra! wild flowers ba yan? @ dhes - hello and welcome to my blog. thanks. @ joy - motion sickness is such an aweful feeling. i remember to have that when i was younger but lots of travel has cured it. like what most of them say "face ur fear"
@ fishing guy - thanks for the warm comment. i appreciate it. @ kingdaddyrich - di ko nakuha. pero talagang artists place ang lugar. parang tam-awan village ng baguio. @ daniel j santos - thank you. i appreciate ur comments. @ redlan - yung iba yata wild flowers eh, pero ang mganda sa lugr eh talagang lahat ng sulok halos may arts and design. Lawstude, hindi ako makahinga sa mga litrato mo. 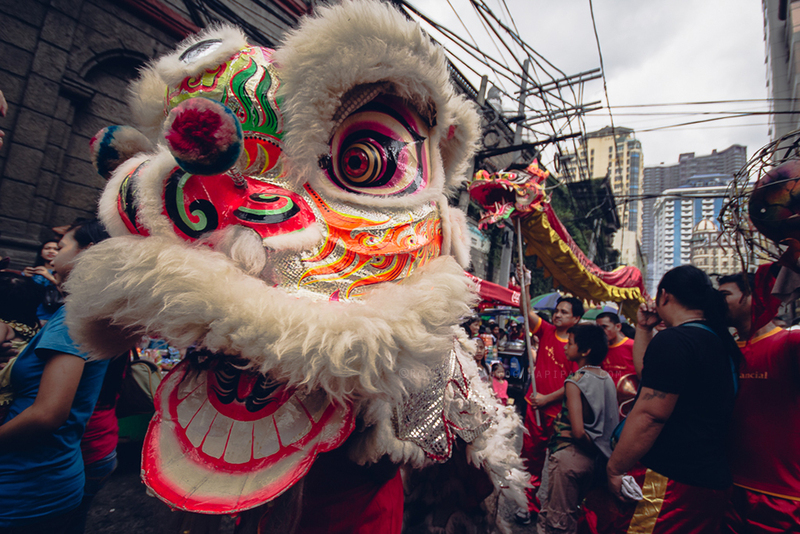 Dapat i-rekomenda ng DOT ang blog mo para maka-akit ng mga turista. Hi! I'm from Banaue. the scene you took was beautiful. yan sana ang gusto kong gawin noon pa eh ang i post sa web ang beauty ng mga products namin good thing you did it for me. Noel is my Uncle lagi akong umaakyat dun. hope madaming bibisita d2 sa amin. 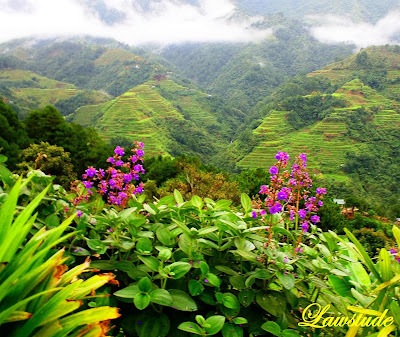 Banaue is a wonderful place, it's also safe... thank you po! 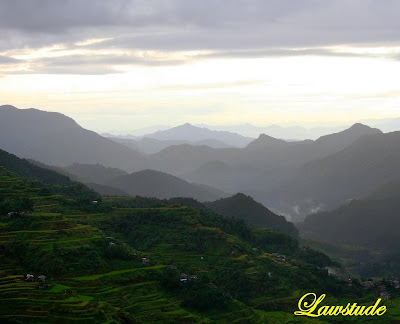 see in Banaue, guyz! binebenta niya yung mga bulol? hindi ba sacrilege yun?